What is the true state of public education, and is more funding–public or private–what is needed to address it? Naomi Klein, scholar-activist and the author of No Logo, noticed a recent trend in the growth of free market reforms and corporate force. Though some of these initiatives had been spreading by certain accounts since the late 1970s, she along with other radical scholars saw a new kind of neoliberal onslaught taking place around the globe over the past ten to fifteen years. The phrase she coined for it was “disaster capitalism”–business initiatives pushed by powerful private bodies in the wake of catastrophe. Halliburton’s relationship to the Iraqi economy both before and after the U.S. war there might be the premiere example, but countless others abound. From Hurricane Katrina in the Gulf of Mexico, the 2010 earthquake in Haiti, to military violence all over the planet, the pattern is of transnational corporate force, sometimes initiating, but always intervening in the wake of a disaster to carve out space for its own economic interests–taking advantage not only of dire and desperate need, but of a lack of community and legal infrastructure to oppose it presence. 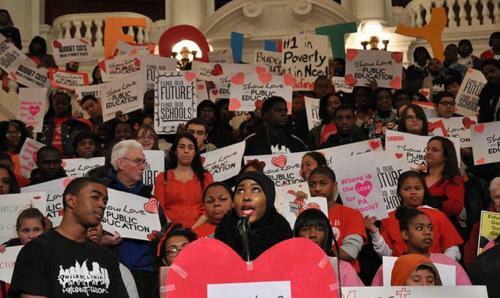 The Philadelphia School District’s announcement two months ago of the essential dissolving and total privatization of its entire public school system has outraged communities across the city, and rallied education activists around the country (though it has received almost no mainstream media coverage). The vehement response has caused the city to back off its originally proposed timeline of closing 64 public schools over the next five years, but the plan to virtually handover the entire school system to private contractors remains in effect. While the recent case in Philadelphia represents a sobering new chapter in the history of education privatization, states, neighborhoods and districts around the country–and, indeed, around the world–have been giving over control to private companies and organizations, disbanding unions and attacking labor, with less and less resistance. Many of the school systems which are most effected by these changes are underfunded, unsupported, and host largely poor, brown, and immigrant student populations. What are the connections between all these factors, and to disaster capitalism? I believe that we can easily describe the state of public education, particularly for oppressed communities, as one of disaster–not because of teacher unpreparedness, lack of funding or low test scores, but because it is a dated, industrial system which is not now, nor was it ever prepared to handle the immense realities of the social, cultural and economic disparities which it itself has aided in creating. That powerful private bodies can understand the desperate need–not only of floundering school systems, but of the oppressed communities they serve–and can see opportunity for profit is, if terrifying, logical. The precedence for a connection between school privatization and disaster capitalism can easily be established, as one the first major school systems to become almost completely privatized in the U.S. was in the city of New Orleans in the wake of Hurricane Katrina. The lack of infrastructure, political stability and community organizing which Klein describes as the key factors which create an opening for corporate intervention are generated by the disasters of flood and fire, but equally and inexorably by those of war, poverty, disease and starvation. That the very bodies which have created these conditions for their own benefit, should suddenly step in to save the communities they have denied and siphoned resources away from, is offensive. That they should do so with the intention of creating more profits for themselves–in the form of oppressed bodies, diligent workers, and de-unionized labor in the case of charter schools–is something we must stand up and fight against. That education is a human right, and something which every person is entitled to, is something I hope we can agree on universally. That traditional education, either publicly or privately funded, is what will make empowered learning accessible to all people is another, more difficult question. While the trend in recent years to utterly abandon any commitment to public education is scary, the goals of traditional public schooling themselves are not so different from those of privatized learning, i.e. creating a competitive environment which produces docile workers and bolsters a capitalist economy. As we continue to fight for education as a basic human right, what kind of education will we fight for? If we acknowledge that our people and our communities are in a state of dire need, do we believe that traditional education–public or private–is the first place to begin healing, empowering and reenvisioning them?